Now I am not a huge Doctor Who fan but everybody else in our house LOVES it. Especially my 6 year old who is a bit of a doctor who geek. 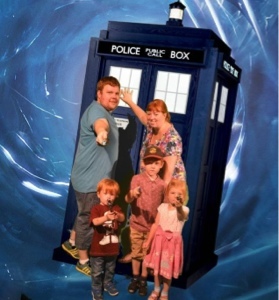 When the doctor who experience opened in Cardiff last year, I knew it was a trip I wanted us to make! The drive to Cardiff is Long! It took 8 hours to get there. We stayed in the premier inn South Cardiff which was a bargain at £29 per room (bought in the sale). The hotel had free parking and was only £5 in a taxi (or a 30 minute walk) to the city centre which made its location ideal as city centre parking can be expensive and a nightmare! We pre-booked our tickets on-line and they cost £13 per adult and £9 per child. Under 5's were free so for us, this was very good value for money! The experience is signposted throughout Cardiff bay and the kids loved finding the way by following special dalek signposts. Tours set off every 20 minutes. We arrived a little early for our allocatwd time slot. There are a few displays in reception and a machine where you can make your own doctor who penny which kept us amused while we were waiting. The first part of the tour lasts about 20 minutes and is a fully interactive experience. First of all we watched a short doctor who film under the watchful eye of a dalek hiding in the shadow in the corner of the room! We all kept an eye on him! Then the screen we were watching magically opened up and we entered an old museum. Suddenly, the doctor himself appeared on a tv screen in the room and started talking to us and then the tardis magically appeared in the room from nowhere! The doctor told us to quickly make our way into the tardis! I've got to say, it was all very realistic and the kids were thrilled and absolutely loved it! The doctor again appeared on the screen inside the tardis and everybody was instructed to take a control of a certain part of the tardis (we were diagnostics). As a team we then 'flew' the tardis which involved lots of sound effects, flashing lights and moving floors. Kids were in their element! However, something went wrong and the tardis landed in a dalek spaceship! We were chased from the tardis by real daleks and ended up in their control room. Pretty quickly we were surrounded by daleks and we got pretty close to being exterminated (this part might be a little scary for very small children but my 2 year old and 4 year old managed it well). 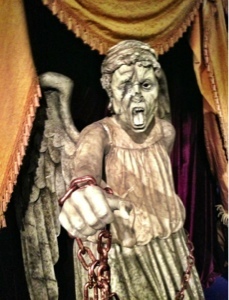 Fortunately, the doctor himself came to our rescue and we escaped by running theough a corridor full of weeping angels in which we were warned not to blink! Our interactive experience ended with a 4D film featuring enemies of the doctor and I've got to say I jumped a few times! The interactive part of the museum was absolutely fantastic. Everything was realistic and my children believed everything was happening to them. 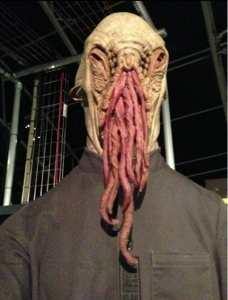 The second part of the doctor who experience is a more traditional museum full of real props that are actually used on set. I've been dragged to a few doctor who exhibitions in my time and this is hands down the best collection I have seen. You can get pretty close as well. They do ask you not to touch though as the props are still in use! In fact David Tennant had paid the museum a visit just a few weeks before to film a few scenes with the tardis. There are some nice interactive parts of the exhibit to keep the children entertained - we had a few photo's taken using props (£15 for 2 pictures), we all had a turn of standing inside a real dalek and controlling it ourselves and used a dalek and cyberman voice changer to record out own voices. As usual, you have to exit through the gift shop! There was a large selection of memeobilia on sale and something for everyone. Some things were over priced (£50 for a doctor who scarf!!) however some things were reasonable we settled for a doctor who mug, DVD, doctor who bag and 2 talking daleks which came to just over £30 and are a nice memory of our trip. 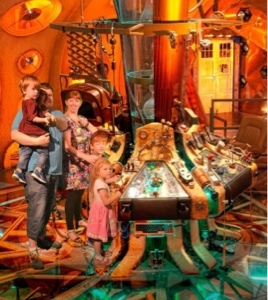 So......if you have a doctor who fan in your family I would whole-heatedly recommend a visit to the doctor who museum in Cardiff. Even a fair weather fan like myself would enjoy it. I only wish we could have stayed in Cardiff a little longer as it was a beautiful city and there was a lot on offer for a family to enjoy.